Great practice ammo. Ordered 1000 rounds a few months ago and just shot my last 100 rounds yesterday. No problems, and not as dirty as other brands. Am getting ready to order some more. Blazer Brass is good stuff. 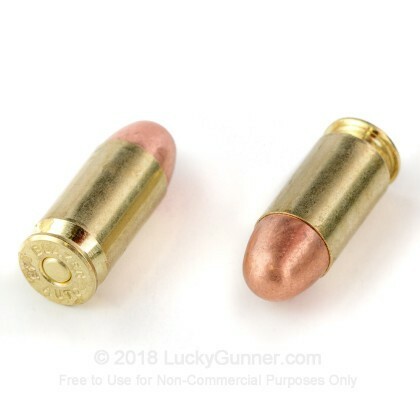 I used to shoot steel cased ammo to save money, but after trying Blazer Brass a while back it's hard to sling dirty rounds when there is proven ammunition for a few bucks more. I've ran Blazer Brass through custom 1911s, Sigs and an HK45 with absolute flawless run time. No problems at all and very clean = great ammo. Lucky Gunner makes buying ammo simple and hassle free. Ammo's fine. Performs as expected. I ran 300 rounds through my Kimber and no issues. Not the cleanest shell but no problems and a good round for the money. 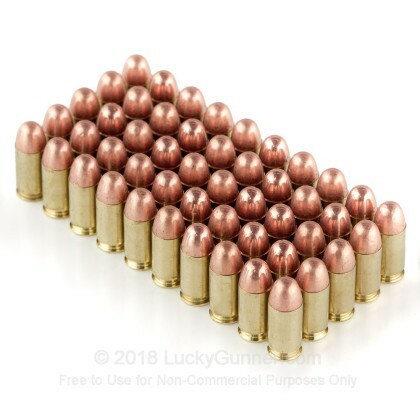 Ordered 1000 rounds of this ammo to split with a couple of friends and at the range it worked fine in several different .45 pistols. No hiccups and reasonably accurate. 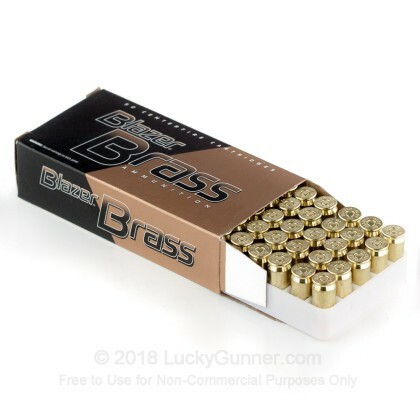 Great ammo, great price, and excellent service from Lucky Gunner. Very satisfied. I purchased a new Glock 21 and fired 150 rounds of Blazer FMJ, 180 gr. without a malfunction. I feel that it is a great range ammo and fairly easy on the wallet. I would recommend it to a friend and will purchase more in the future. No malfunctions through my SIG P250 , I used it to test for my CCW and it ran flawlessly, a really great ammo at an ok price. Not so great if you're a reloader due to the smaller primer used but it was reliable. 50 rounds thru my 1911 with NO Problems. great service, excellent product, superior prices! 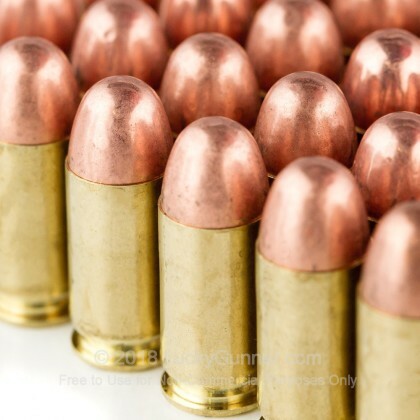 I have fired 100 rds of this ammo through 4 of my 1911s and all of them performed well. But, if you are a reloader, be aware that this brand of ammo uses small pistol primers instead of traditional large pistol primers. Now I have to go through all of my brass to sort out the Blazer and scrap them. I hope whomever decided to screw up this perfectly good brass with this stupidity has every future joyful moment ruined by something exceedingly unpleasant for the rest of their filthy life. Note the .45 uses a small pistol primer. Not a problems if you don't reload. I also have Federal, Winchester & Magtech brass all use large pistol primer. Back to sorting brass. If you are planning on using the brass from this ammo to reload, double check it. Most of the Blazer stuff is using small pistol primers as of recent. 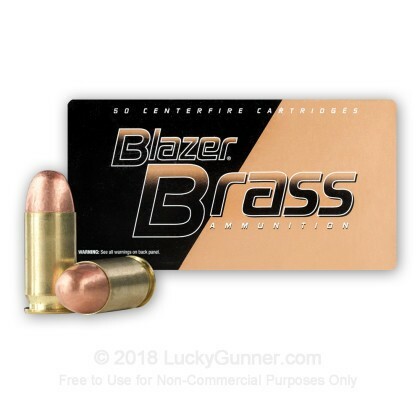 Q: Is all Blazer Brass ammo that states FMJ, full metal jacket, or is it copper plated? Is this particular ammo plated or FMJ? Thank you! A: Hello Pat, While Blazer Brass lists their ammunition as being FMJ, it is actually loaded with a plated projectile and Blazer does not recommend the ammunition for use with ported barrels because of that. 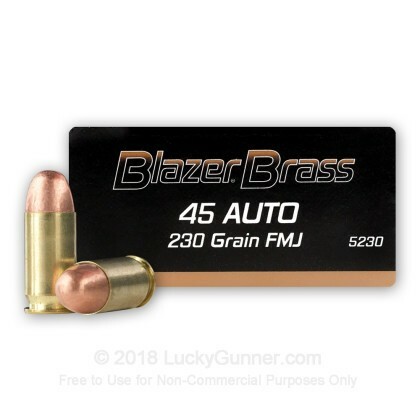 We also have this 45 ACP - 230 gr FMJ - Blazer Brass - 1000 Rounds ammo in stock in a bigger quantity.